If the spending isn’t cost-effective, file it under government waste. While lecturing on space warfare for the United States government last week, I was approached by an Air Force officer who insisted that the “Pentagon had too much money.” I responded that I agreed with him in general, but that in specific, key areas — such as space and cyberspace — I worried that funding wasn’t getting to where it was most needed. Recently, the Government Accountability Office (GAO) reported that many of the Pentagon’s advanced weapons system are easily hackable because of “poor password management and unencrypted communications.” Another report indicates that 66 percent of U.S. military service members are out of shape. Meanwhile, the new American military commander in Afghanistan was almost murdered by purported “friendly” Afghan troops who had grown tired of the American presence in their country. We’ve been told ad nauseam that the 2016 presidential election was “hacked” by Russia (a country with a GDP the size of Italy and a life expectancy that matches those of Great Britain in the 1960s). The Chinese are outpacing the United States in the development of key strategic technologies, like quantum computing, and theocratic Iran could embroil the United States in a major regional war. Yet, the Pentagon’s budget is the highest it has been since the end of the Cold War. Shouldn’t America be safer than it has ever been? The Air Force officer I spoke with after my lecture was correct. 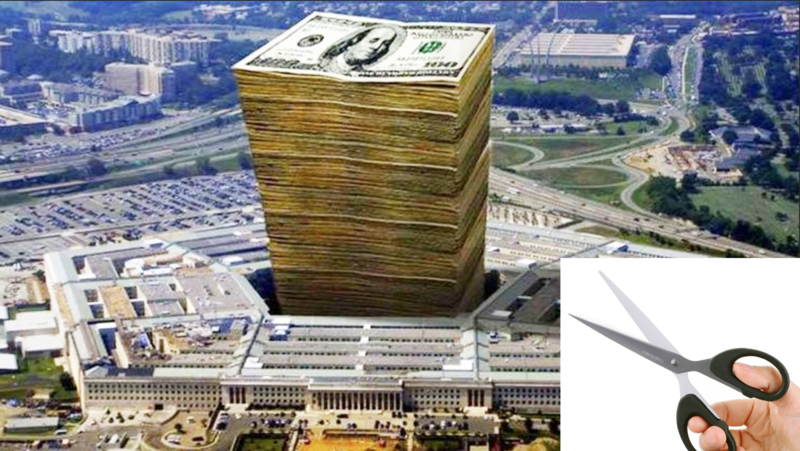 The Pentagon doesn’t need more money. It just doesn’t know how to spend the massive amount of money it’s been given! What’s more, retrograde Congressional appropriations practices mean that the Pentagon faces an uphill battle in developing the weapons needed to fight the wars the United States is bound to face. We live in a society that tells us that “bigger is always better.” Yet, this is not true — especially in today’s world of decentralized networks. When an organization gets too big for its own good, it tends to collapse under its own weight. This is not the case in government, of course. Excess is prized in the government (at the expense of the taxpayer); the only thing that bureaucrats value are inputs (as opposed to outputs). More problematic is that the Pentagon is treated with quasi-religious reverence because it represents the United States military. Congress also views the DoD as a glorified federal jobs program. Because of its vaunted position, the Department of Defense is lavished with taxpayer dollars — so long as it spreads those dollars to important congressional districts and to highly connected defense contractors. Naturally, since the DoD is the lead entity charged with national security, it is also highly opaque — making oversight damn near impossible. What other government agency with such a large operating budget could “not track $2.3 trillion” (you read that right) of hard-earned taxpayer money in 2001, and have no serious inquiry into the matter? The two areas that should be given budgetary priorities, space and cyberspace defense, often get short shrift; Pentagon leaders (and Congress) prefer to spend gobs of taxpayer dollars on legacy programs — such as the F-35 — that aren’t as valuable today as they would have been 20 years ago. Imagine how useful a space-based missile defense system or a serious cybersecurity program for defending America’s industrial and military secrets from hacking would be today compared to the $1 trillion boondoggle that is the F-35 program. The fact that America’s defense is costing so much money is itself a national security threat (when the United States is nearly $22 trillion in debt — and counting). Still, the United States needs a strong military. America also needs a cost-effective one. Today, the DoD is required to do too much with cumbersome, expensive equipment — and without enough personnel (and, since the United States military is an All-Volunteer Force there will never be a large enough pool of recruits to satisfy the demands that are presently placed on the DoD). Barry Posen is correct: Washington must shed some of its defense commitments. In terms of foreign policy, not every problem requires a military solution. There are many prickly issues that the United States must face around the world that require diplomacy, trade, or another non-military solution. Yes, diplomacy backed up by strong military force is the best thing possible. Although such coercive diplomacy is only believable if the United States military is not perceived as being stretched to its proverbial breaking point — even as it receives more funding than the defense establishments of the next ten countries. This is precisely how American rivals, such as China and Russia, perceive the United States military today. A few years ago, the much-maligned (though brilliant) SpaceX CEO, Elon Musk, fought to get the Air Force to use some of SpaceX’s Falcon 9 rockets to launch their satellites. Former Air Force Chief of Staff, General Norton Schwartz, stated that he didn’t want “to trust the crown jewels” to an experimental rocket (never mind the fact that SpaceX’s rockets cut the costs of U.S. military satellites by half). One of the biggest hurdles to properly defending the country in today’s complex threat environment is the fact that the costs are too damn high. Lower those costs through free market reforms — by allowing for real competition within the DoD’s procurement process — and you’ll make things like space defense a reality in a short time. This also requires a serious culture shift in the Pentagon itself; among the military branches and within the civilian leadership. It means that Congress will have to start handing off some authority that it presently prizes to the Pentagon (so that different pieces of a new weapons program aren’t built in 50 different states). Meanwhile, both the White House and the Office of the Secretary of Defense will have to pressure the Pentagon bureaucracy itself to embrace the changes that I’ve advocated — and they must be willing to fire bureaucrats who are either serving redundant functions or are obstructing the reforms that I’m advocating. Without these reforms, a rising China just might be able to get the proverbial jump on the United States when Washington least expects it. And, unlike in the Second World War, the margin for error today is too small. The United States might not have the opportunity to punch its attacker back once it is attacked. For more awesome content, check out The American Spectator!